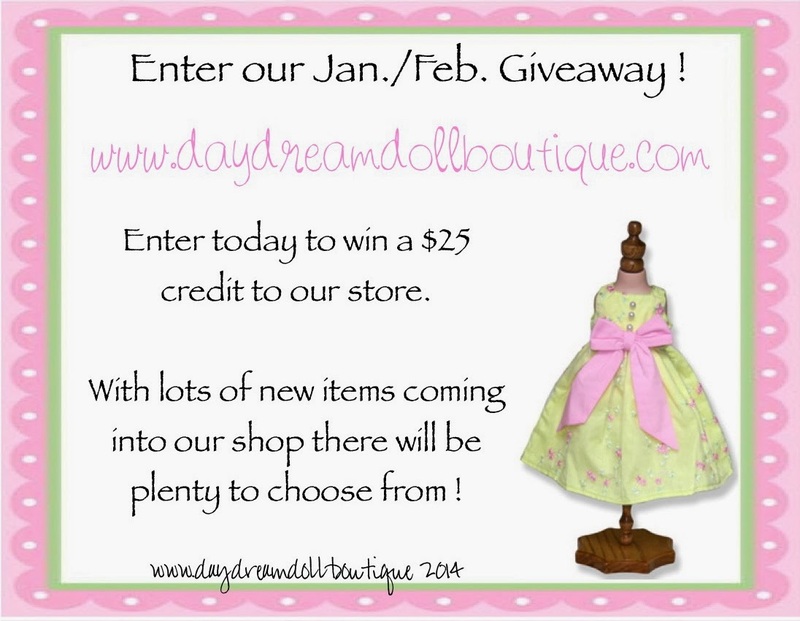 Go to the Daydream Doll Boutique web site and take a look around. Come back here and leave a comment telling us your favorite Sporty Outfit and what you would pair it with from the website. Leave your comment(s) no later than midnight March. 31 , 2014. I'm a follower. My favorite sporty outfit is the Warm-Up Set and would pair it with Velvet Dress Flats to minick ballet shoes. I like the Just Dance Sweatsuit! I would pair it with the Doll Sized iPod so my doll could listen to music while she dances!!! My favorite is also the warm-up set with the velvet flats. Just a beautiful outfit. I absolutely follow your blog. How could you have a doll and not:) Also follow you on Pinterest. I would love a basketball uniform with sneaker if you ever make one. I love the Just Dance Sweatsuit. I would pair it with the white Lace Cami underneath. Oh, and I'm a follower :). I left a comment about your site on facebook. I'm a follower and I love the pink heart lounge outfit with the pink high tops. I am a follower of your blog and I would love to enter! My favorite outfit is the Lavender Jogger w/ Sneakers. thanks for the giveaway! My favorite outfit is the Summer Fun w/ Sneakers! Awesome! I follow. I posted about this giveaway at http:/agfanblog2013.blogspot.com. Cute n sporty with the pink newsboy cap in pink! I am also a follower of your blog! We would chose the Ballet Warm Up Set and we would pair it with the Fluffy slippers cause they feel sooooo good on your feet after ballet class! Shared the link for your contest on my FaceBook! I love the Ballet Warm-Up Set and I would pair it with the just dance shorts when my doll wants to take her tutu off. My favorite Sporty Outfit is Summer Fun w/ Sneakers and I would pair it with Doll Size iPod so my doll could go for a nice jog. I like the Just Dance Sweatsuit and I would pair it up with zebra sneakers! Thanks for the giveaway! the Sporty Outfit I love is Just Dance Sweatsuit w/Sneakers and I would pair it up with Diva Doll Sunglasses because that's how we roll!! I would like to enter your giveaway, I follow your blog and I love the Sporty Outfit is Summer Fun with sneakers and I would pair it with fluffy slipper so my feet can get nice and comfy after a hard workout!